We at Grandmother Diaries would like to express our thanks to all those who serve, have served, and will serve the United States of America along with their families. In honor of Memorial Day I thought I would plant a couple of Purple Heart plants. They are a lovely perennial and very hardy. I am planting them in containers this year, but they may graduate to ground cover in future years. What are you doing this Memorial Day? I absolutely love this plant and had many of them in my garden in Wisconsin. 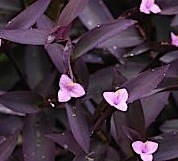 I'm not sure why, but the purple heart seems to have a spirit…I loved having this ground cover in many places. So glad you like it as well. I think it has real presence and beauty. What a beautiful flower. And that is a LOVELY tribute Cheryl. My husband is an in-country Vietnam Vet. We're headed to a car show today where we know there will be Memorial Day gratitude in abundance. Thanks Pat. Sounds like you will enjoy your day as well. I've seen this plant here and there, but never knew what it was called. I just got back from DC last night at 12:30. It was a busy few days, but was great to be in the nation's capitol on Memorial Day weekend. Yes, these are really a lovely plant and very appropriate for the Memorial Day holiday! Pretty plant. We are still fighting with our veggies, not sure I could take adding something else to the mix. That's a wonderful tribute and great way to express your thanks to all those that served. I'm sure these are going to grow to be beautiful plants too.